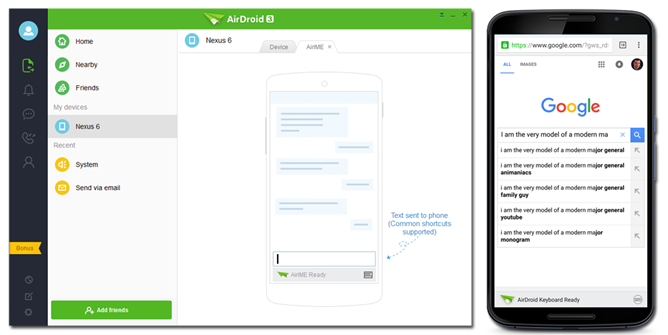 It's no secret that we at Android Police are huge fans of AirDroid. A big part of that is because the developer is constantly updating the app with new features. So it is with the latest version, 3.2, which adds a handful of new goodies to the remote management tool. Some of these require use with an updated version of the dedicated desktop app (instead of the more popular browser version). The coolest addition to the program is the ability to type directly into input fields on your phone with your computer's keyboard, which is now the best possible solution for typing on Android until someone releases a mechanical keyboard five inches wide. To do so, start the desktop app in Windows or OS X, connect your phone, then click the binoculars icon to begin AirIME. Once you confirm the connection and enable root, it will allow you to type into any Android text field. The update also allows users to instantly transfer copied text from a PC clipboard to a phone or vice versa in the same window. The updated app can also dim the phone screen when AirMirror is active, and the app now supports replying to Skype and Line notifications directly from the desktop interface. The desktop app now includes a screen recording function with AirMirror (though I couldn't get it to work on my PC). There are also bug fixes and other miscellaneous improvements. Google Play seems to be updating AirDroid without any pesky rollout delays, but you can also download it from APK Mirror for devices without Google services. To access the new mirroring and typing features, you'll need to update the Windows or OS X application to version 3.3. [Weekend Poll] How Do You Secure Your Phone's Lock Screen?